Where better to start our adventures in Bordeaux than the milestone which originally marked the geographical centre of the city and designated the spot from which distances to and from other places were measured? 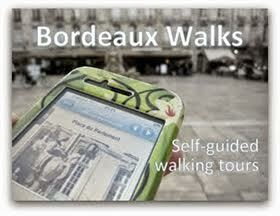 Today, as is now customary in all French towns and cities, the Bordeaux “kilometre zero” is the city hall, the Hôtel de Ville. 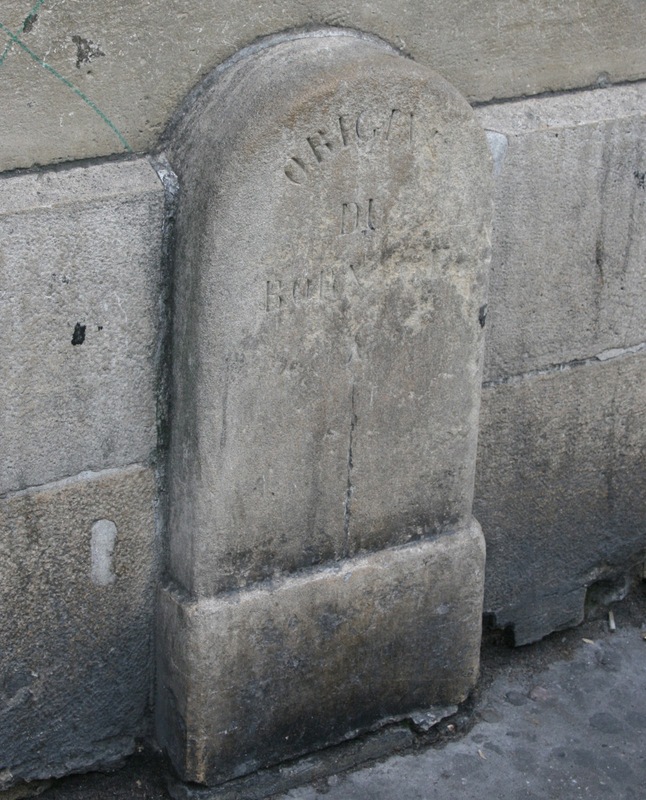 But this milestone, still known locally as “la borne du kilomètre zéro” (kilometre zero marker), was positioned on Place Gambetta sometime in the mid-19th century. It is a staple feature in every guide you’ll find to the more unusual sights to see in Bordeaux, and yet still sits there unnoticed and virtually ignored by passers-by, camouflaged as it is by the 1859 building that encases it. 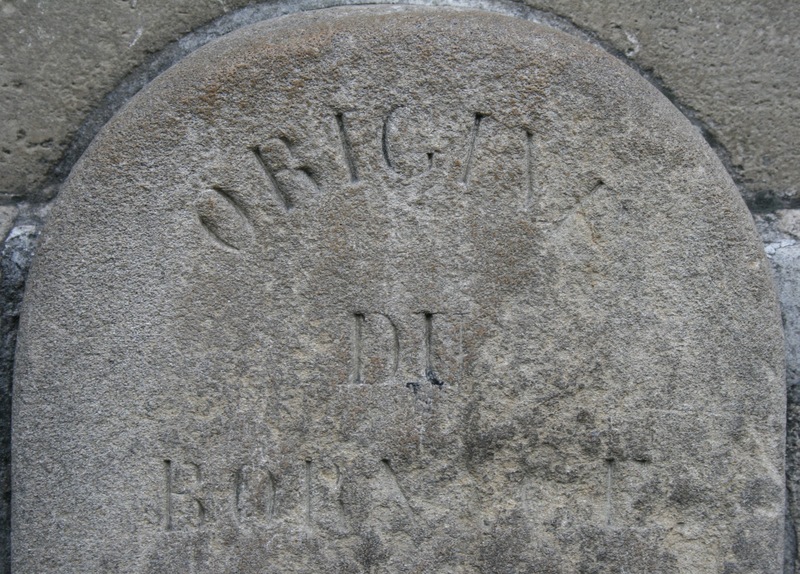 The wear and tear of the passing years is clear to see; even the text is almost illegible. 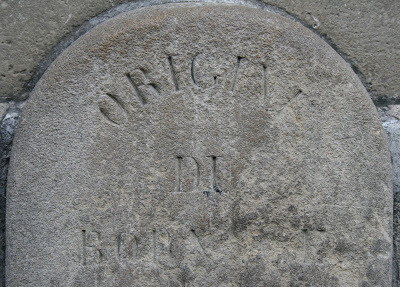 It reads “Origine du bornage”… although the letters n, a, g and e have long since given up the fight! 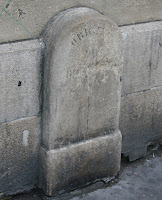 The milestone itself though should survive a little longer: it and the adjoining building are now jointly registered as part of France’s national heritage in the “Inventaire supplémentaire des monuments historiques”. 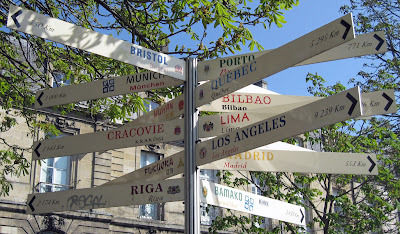 And the status of the location as the spiritual heart of the city does continue to live on: just opposite the borne, on the square, a multiple signpost was erected in March 2008 to display the direction and distance to all of the cities around the world that are twinned with Bordeaux! 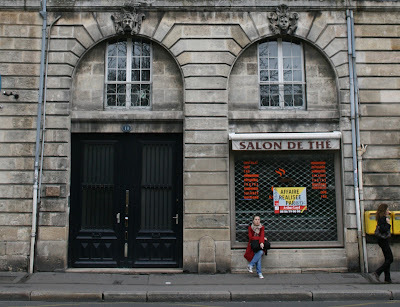 Moulin de Tiquetorte: nothing run-of-the-mill!